Sat., April 14, 2018, 9:05 p.m. The induction of four men in the Class of 2018 highlighted the 56th Idaho Athletic Hall of Fame banquet Saturday night at the Best Western Plus Coeur d’Alene Inn. Former University of Idaho football standouts Sam Merriman (1979-83) and Sherridan May (1991-94), and Silver Valley high school stars from the 1960s, Denny Almquist (Mullan) and John Shelt (Kellogg), were enshrined and North Idaho Sports Award winners were honored. College Team of the Year: Lewis-Clark State baseball. College Coach of the Year: Russell Grove, North Idaho golf; Don Verlin, Idaho men’s basketball. 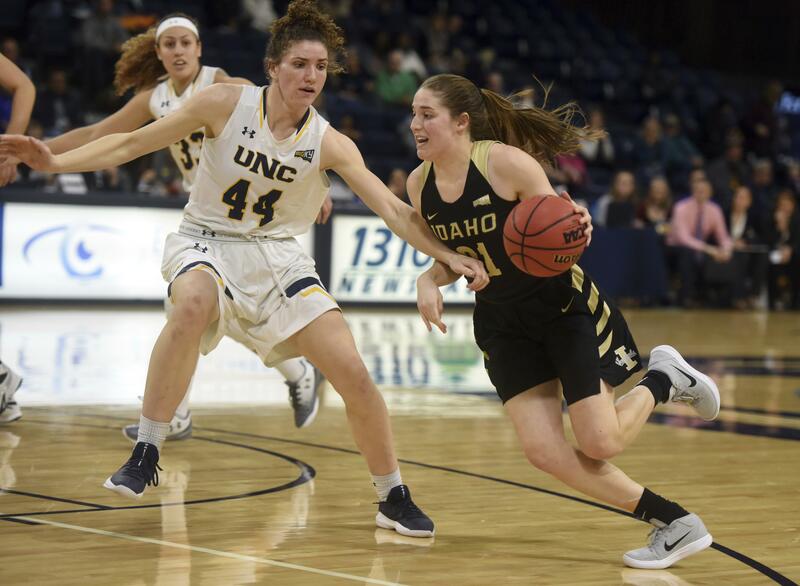 College Female Athlete of the Year: Mikayla Ferenz, Idaho basketball. College Male Athlete of the Year: Brayon Blake, Idaho basketball. High School Male Team of the Year, 5A-4A: Post Falls wrestling. High School Male Team of the Year, 3A-1A: Lapwai basketball. High School Female Team of the Year, 5A-4A: Post Falls basketball. High School Female Team of the Year, 3A-1A: Coeur d’Alene Charter soccer. High School Male Coach of the Year, 5A-4A: Pete Reardon, Post Falls wrestling. High School Male Coach of the Year, 3A-1A: Simon Miller, Kellogg golf. High School Female Coach of the Year, 5A-4A: Mark Allert, Post Falls basketball. High School Female Coach of the Year, 3A-1A: Ryan Hasselstrom, Prairie track; Stacy Smith, Coeur d’Alene Charter soccer. High School Male Athlete of the Year, 3A-1A: Chase Jerome, Kellogg; Ryan Morgan, Kellogg. High School Female Athlete of the Year, 5A-4A: Ashley Kaufman, Lake City; Melody Kempton, Post Falls. High School Female Athlete of the Year, 3A-1A: Shelby Starr, Timberlake. Boys golf: Cade Finlay, Kellogg. Girls golf: Emily Dodge, Lake City; Makena Rauch, Moscow. Boys track, 5A-4A: Grady Leonard, Coeur d’Alene. Boys track, 3A-2A-1A: Cole Olson, Clearwater Valley. Girls track, 5A-4A: Emily Hernandez, Lake City; Katherine Ruck, Moscow. Girls track, 3A-2A-1A: Maisie McManus, Deary. Boys tennis: Derek Wendt, Moscow. Girls tennis: Khloe Kyllonen, Sandpoint; Laney Search, Sandpoint. Softball, 5A-4A: Ashley Kaufman, Lake City. Softball, 3A-2A-1A: Kadi Bateman, Bonners Ferry. Baseball, 5A-4A: Jackson Sumner, Coeur d’Alene; Riley Way, Lewiston. Baseball, 3A-1A: Jesse Dunham, Bonners Ferry; Nick Sabin, Bonners Ferry. Volleyball, 5A-4A: Klaire Mitchell, Lake City. Volleyball, 3A-1A: Lindsey Kwate, Troy. Football, 5A-4A: Caleb Beggerly, Coeur d’Alene. Football, 3A-1A: Edward Becker, Genesee. Boys soccer: Kyle Sanchez, Post Falls. Girls soccer: Riley Walkington, Sandpoint. Boys cross country: Chad Humphrey, Coeur d’Alene; Joey Perez, Lewiston. Girls cross country: Sydney Shanahan, Post Falls. Boys swimming: Jon Archer, Post Falls. Girls swimming: Payton Bokowy, Sandpoint. Girls basketball, 5A-4A: Melody Kempton, Post Falls. Girls basketball, 3A-1A: Amil Mitchell, Lapwai; Shelby Starr, Timberlake. Boys basketball, 5A-4A: Jake Pfennigs, Post Falls. Boys basketball, 3A-1A: Jonny Hillman, Genesis Prep. Wrestling, 5A-4A: Ridge Lovett, Post Falls. Wrestling, 3A-1A: Carson Morrow, Clearwater Valley; Layton Paul, Potlatch. Published: April 14, 2018, 9:05 p.m.